From Gold Light to Original Ginger: We updated our cans! We've heard a few questions recently about the name change of one of our most popular kombucha flavors, from Gold Light to Original Ginger, so we're here to clear up any confusion! They're the same great taste, made from the same secret recipe. Read on for more. When Kombucha Town was founded in 2011, we offered just two flavors of kombucha — Signature and Gold. The Signature Kombucha is brewed with organic Ceylon black tea and organic sugar; the Gold Kombucha is the same recipe, but with a ginger twist. Both flavors were packaged in refillable 32oz glass bottles and sold as a traditional alcoholic kombucha. To this day, many of our dedicated customers still use our original bottles as growlers and bring them into the Culture Cafe for a refill — we still have Signature and Gold on tap! By 2012, our Gold Kombucha emerged as our most popular flavor. Brewed with Ceylon black tea, the kombucha is then blended with our very own ginger ale — made from fresh ginger, lemon, and clove. The final product tastes like a slightly sweet but tart ginger beer, with the added bonus of an additional digestive boost (thanks, kombucha culture + ginger!). As time went on, the Kombucha Town team realized there was a HUGE demand in the market for non-alcoholic kombucha. This type of kombucha is more accessible and approachable to a new kind of fan — one looking for a slightly sweet, but healthier alternative to soda. In addition, we saw an amazing potential in packaging kombucha in aluminum cans, which are easier to transport and are more environmentally friendly. Packaging kombucha in cans hasn't been done widely by the kombucha industry — but we were ready for the challenge. 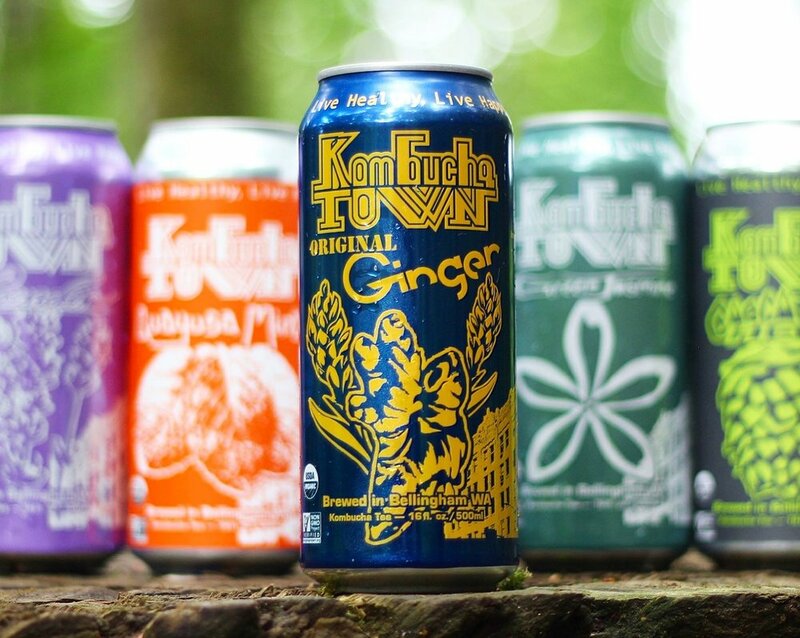 In 2014, we launched a line of non-alcoholic kombucha in 16oz cans. We started with four flavors: Gold Light, Green Jasmine, Blueberry White, and Guayusa Mint, and added two more flavors in 2016: Lavender and Cascadian Hops. Upon launching our line of kombuchas in cans, Kombucha Town started growing in leaps and bounds, and we have never looked back. The Gold Light Kombucha in cans is brewed from the same recipe as our original Gold Kombucha, but is offered as a non-alcoholic option. And just like the Gold Kombucha before it, the Gold Light Kombucha in cans quickly became our most popular flavor coveted by students, bartenders, and soccer moms alike. For the past three years, our Gold Light Kombucha has reigned supreme as our most popular flavor in cans. As part of a recent packaging tweak and redesign, we decided to change the Gold Light name to Original Ginger. Our NEW Original Ginger Kombucha can is the same delicious flavor as Gold Light — but now with easier to understand labels for our customers and stores. If you've been with us from the beginning and are a Kombucha Town Original Gangster (OG), make sure to celebrate our new name change by treating yourself to a tasty and refreshing Original Ginger (OG) Kombucha. Cheers!